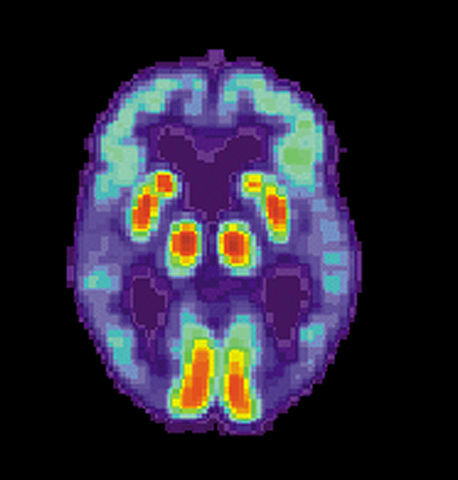 PET scan of a human brain with Alzheimer's disease. Caring for a loved one who is living with the debilitating effects of Alzheimer’s or Parkinson’s can lead to burnout, a danger for both the caregiver and the care receiver. Identifying the symptoms is the first step in doing something about it. This is the essence of the message delivered by Apostolia Petropoulos, a social worker who coordinates the Caregiver Navigator Project for the west-end health services network, the CIUSSS Centre-Ouest-de-l’Île-de-Montréal. She spoke to an attentive audience of caregivers at the Westminster offices of Alzheimer Groupe Inc. (AGI). The group offers activities for those with Alzheimer’s as well as respite to assist caregivers. Petropoulos pointed to various sources available on the Internet that offer advice to caregivers including homewatchcaregivers.com, where stress on the person offering care is singled out as a trigger for burnout. “Ask for help – take time to take care of yourself so you don’t become a patient as well,” Petropoulos said. Warning signs may be expressed physically with sleep problems, tension headaches, weight gain or loss; emotionally with expressions of anger or mood swings; and behaviourally with alcohol and/or drug abuse, or withdrawing from relationships. • Feel like you have to do it all yourself and that you should be doing more. • Withdraw from family, friends, and activities that you used to enjoy. • Worry about the safety of the person you care for. • Feel anxious about money and healthcare decisions. • Deny the impact of the disease and its effects on your family. • Feel grief or sadness that your relationship with the person isn’t what it used to be. • Get frustrated, angry, when the demented person repeats things, doesn’t seem to listen. • Have health issues that are taking a toll on you. Many online sources for caregivers outline the danger signs. One of them, posted by the American Association of Retired Persons (aarp.org) emphasizes that when taking care of others, it’s critical not to neglect your own mental and physical health. 1. Put your physical needs first, eat nutritious meals, get enough sleep, and nap during the day if you have trouble sleeping at night, get regular medical checkups, and find time to exercise. 2. Avoid isolation, connect with friends and relatives. 3. Ask friends and relatives to pitch in. 4. Use community service to share in some caregiving duties. 5. Take a break by planning respite care with friends, relatives, or volunteers, and use adult day centers. 6. Share feelings of frustration with friends and family. 7. Find time to relax and enjoy reading, walking, and music to recharge batteries. 8. Prioritize responsibilities, and remember you can’t do it all. 9. Don’t feel guilty about what you can’t do. Focus on what you are doing for a loved one. Caregiving is one of the most isolating experiences and that’s why support groups are important, Petropoulos said. They can offer tips, resources, and the possibility of calling in volunteers to lend a hand. “There are people who are eager to volunteer and offer help,” she said. Of course, as one participant pointed out, it’s not always easy to get a loved one to accept a replacement. She said her husband refuses to allow anyone else but her to look after him. Petropoulos invited Montrealers to get in touch with her at the Caregiver Navigator Project for volunteers that she coordinates, in cooperation with the CLSC Benny Farm and CLSC René Cassin. It is funded in part by the federal government’s New Horizons for Seniors program. It is a volunteer peer-membership program that offers support for 55 plus whose caregiving duties have increased their feelings of isolation. Volunteers are trained. Caregivers often will need education and counselling as the needs of the person receiving care grow as do the stresses and strains of providing it. That is where the Alzheimer Groupe (AGI) can help with its varied support services and programs. Among these are its respite programs for caregivers, offering much needed breaks as its trained professionals offer a range of activity programs for people with dementia. Their therapeutic programs are tailored to the individual, and aim at enhancing abilities while compensating for challenges. In-home respite, called Respite on Wheels, is also offered for those who cannot attend group programming. These visits of 3-4 hours offer personalized and meaningful activities, and can include bathing. Men in the Kitchen is a program for male caregivers who can no longer depend on wives to do the cooking. Among new programs is one linking generations through song, for caregivers, the diagnosed individual, and grandchildren, meeting twice a month on Sundays. They also have a new pilot mentorship program linking caregivers with a mentor, and continuing support groups to help caregivers better understand and cope with the challenges they face. 1 Comment on "Alzheimer Groupe offers advice and respite for caregivers"
A comprehensive guide of practical steps that get forgotten when under stress. Short and to the point. Excellent work, Ms Petropoulos.